"[On one occasion I was led] to ponder what people expect to receive from Jesus Christ, from His gospel, and from participating in His Church. I thought of some others who said they stopped going to Church because the Church was 'not meeting their needs.' Which needs could they be expecting the Church to meet? If persons are simply seeking a satisfying social experience, they might be disappointed in a particular ward or branch and seek other associations. There are satisfying social experiences in many organizations. If they are simply seeking help to learn the gospel, they could pursue that goal through available literature. But are these the principal purposes of the Church? Is this all we are to receive from the gospel of Jesus Christ? "The Church gives us opportunities to serve the Lord and our fellowmen. If given in the right way and for the right reasons, that service will reward us beyond anything we have given. 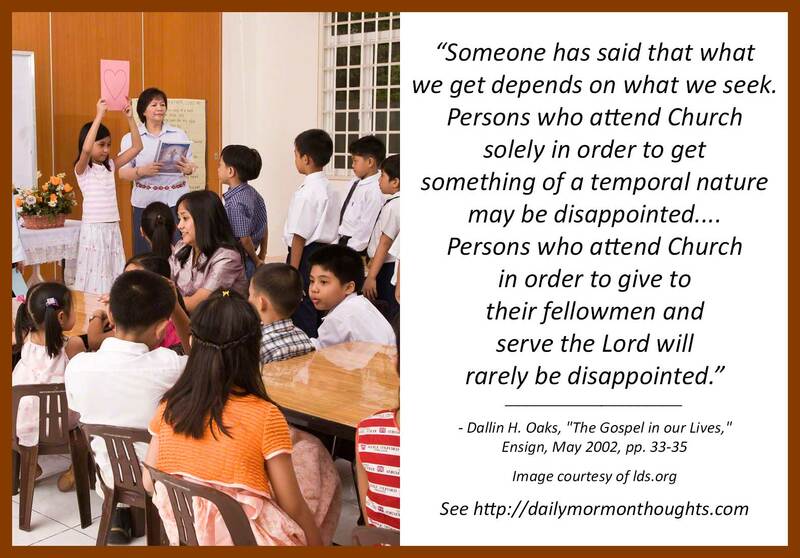 Millions serve unselfishly and effectively as officers or teachers in Church organizations, and those who do experience the conversion described by the prophet who pleaded with us to 'come unto Christ, and be perfected in him' (Moro. 10:32). "Throughout my life I have been blessed by my membership and participation in The Church of Jesus Christ of Latter-day Saints. It is impossible to describe all the ways the Church has blessed my life and the lives of those I love." Why do we attend church meetings? Most of us do expect to "get something out of it." 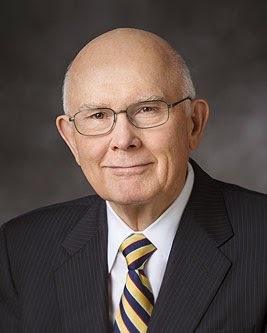 We usually go to be instructed and edified, to worship, to interact with others who can support and inspire us, Elder Oaks points out that if social benefits are the main goal, we're often going to be disappointed in the people we encounter. If our main purpose is to learn more about the gospel, there are other ways to accomplish that. He points out that a primary reason we should attend meetings is not to receive, but to give—to serve others as part of the congregation. Elder Oaks promises that great benefits come from our unselfish service in the Church. And one of the greatest benefits is the personal conversion that results from giving to others in humility and faithfulness. How blessed we are to have that opportunity!